Those looking for a Pokémon journey of a different kind will find that this latest release will more than have your curiosity covered. 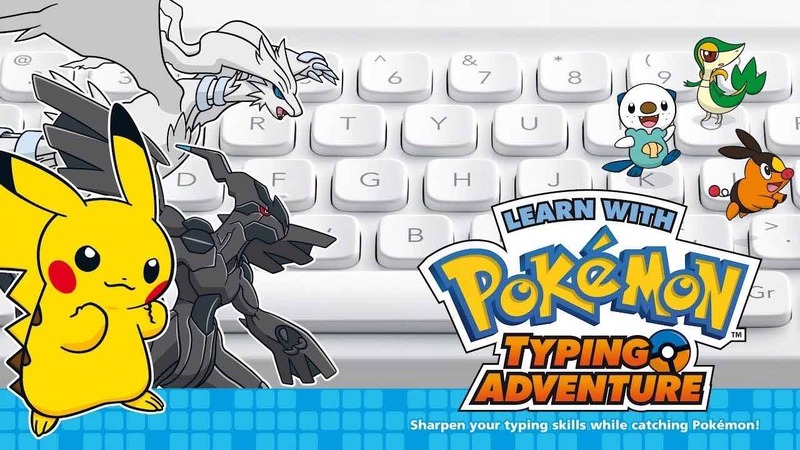 Learn with Pokémon Typing Adventure is exactly that which its name derived – an educational Pokémon adventure that seeks to aid the player in further developing their typing skills through the use of the Nintendo Wireless Keyboard that is bundled alongside the game. 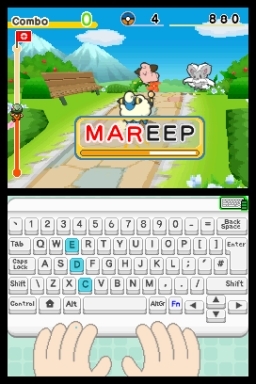 It’s a relatively simple concept, aimed at familiarising the player with the standard UK English keyboard layout whilst also testing accuracy, speed and Pokémon knowledge. Having positioned yourself in front of your handheld comfortably, a Compact Stand also provided to aid you in doing so, you’re set to type away to your heart’s content. The player joins as a new recruit in the Elite Typists’ Club, under the watchful eye of Professor Quentin Werty and his assistant Paige Down. Your goal? To actively research in excess of 400 individual Pokémon through use of special Typing Balls, which gather information on the ever expanding quantity of creatures. 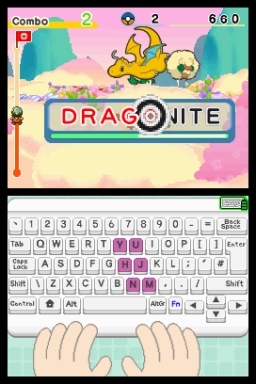 In being able to use these you will initially type the first letter of the Pokémon’s name (i.e. Pikachu = P), with the difficulty suitably heightening as your ability increases, moving to two letters, three and gradually reaching the name in its entirety. Difficulty spikes are also served by bosses, the player required to deflect incoming attacks before they are able to juggle their Typing Ball at them that see you feverishly typing rows of letters. These are rare Legendary Pokémon such as Ho-Oh, with the ultimate goal of studying Reshiram and Zekrom. Every letter and punctuation symbol across the keyboard correspond to their own courses, colourful landscapes that range from Alt Rocky Range to Semi-Colon Cavern. There are 60 in total, with the player advancing through the ranks of the Elite Typists’ Club as their Medal stockpile begins to mount up, further replay value granted through returning to previous courses to achieve any missed (Bronze, Silver or Gold). Such repetition is also necessary for the player to find all Pokémon that appear on specific courses, either because they randomly appear or when you’re on a typing streak. This allows you to gradually get used to those along certain routes, noticeably improving your response and speed without the player ever really noticing. Those with substantial Pokémon knowledge will also be in their element, with bonus points granted for those that type the name ahead of the game revealing it to you. Even those with a lesser level of knowledge will soon become accustomed to the looming silhouettes in the distance, and this will hold you in good stead. Beyond this, those looking for a greater challenge can turn to additional courses such as the Never-ending Tab Track, or the numbered special courses that include No. 2 Rainbow Railroad. Through the Control Room, you can similarly collect themed virtual keyboard skins and sounds, and receive tips as to how to improve your typing skills, whereas My Room allows you to study scanned Pokémon. If there were any issues with the entire experience, it would only be with the tools at hand. Although geared as a game that is “fun for both beginners and typing pros,” I actually found the supplied keyboard regrettably too small for comfort. Yet this is an entirely unique gaming experience, that I’ve only previously encountered with The Typing of the Dead. Pokémon fans will enjoy putting their knowledge to the test, and parents will be happy knowing that through Learn with Pokémon: Typing Adventure their children are at least being more productive during their gaming time. Older players also shouldn’t so readily dismiss the game, as it proves a great opportunity to hone those typing skills.